1 liter size packet of Ilford ID-11 film developer. 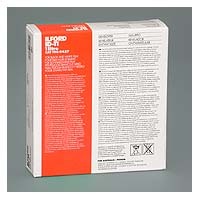 Ilford ID-11 is an internationally recognized fine grain film developer for all general film processing requirements. ID-11 produces excellent results with all B&W films and is ideal where a wide range of films and film speeds have been used, ensuring the best balance of fine grain, sharpness and tonal rendition, and producing negatives which allow a high degree of enlargement. It is mixed with water to create a stock solution, and may be further diluted 1:1 or 1:3 for one-shot processing. For detailed information on Ilford ID-11 and other Ilford powder film developers, please refer to the Technical Information PDF.